For the last several years I've been nursing it back to health. By last fall, it was vigorous again. I decided to leave it in a 1-gal. Rootmaker® for one more year, before potting it on in 2013. But the tree had its own ideas. 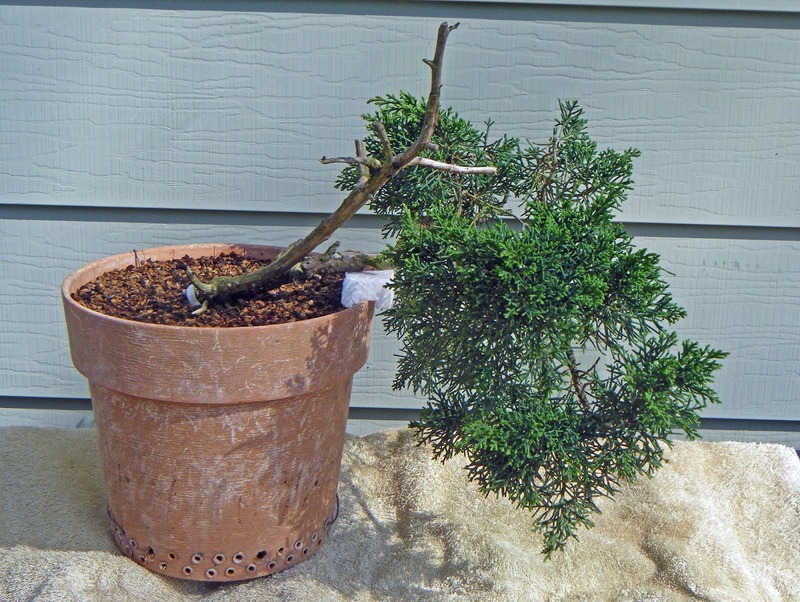 Since it broke dormancy this shimpaku has been using water much faster than I expected; it seemed to need watering twice as often as my other hardy trees! 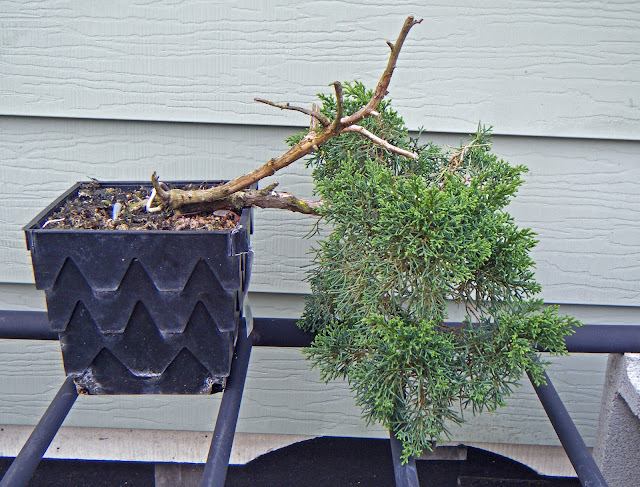 Such a situation, if a tree is healthy, usually means that it has filled its pot with roots and needs to be repotted as soon as possible. Never mind when the bonsai grower had in mind to do it! So yesterday I moved this tree into a roomier growing pot. I found a healthy root system, not as crowded as I kinda-sorta expected. The major root that now supplies most of the tree branches close to its base; this should give me enough secondary roots at the surface for a good nebari. Repotted. The styrofoam block maintains the planting angle while the roots re-establish themselves. The new mix is Turface and chopped sphagnum, at approximately 7:3, sifted to remove fines. The new pot is a standard plastic planter. (I added extra holes with an old-style soldering iron in an attempt to duplicate the air-pruning results of a Rootmaker®. I've never been sure whether my idea works.) 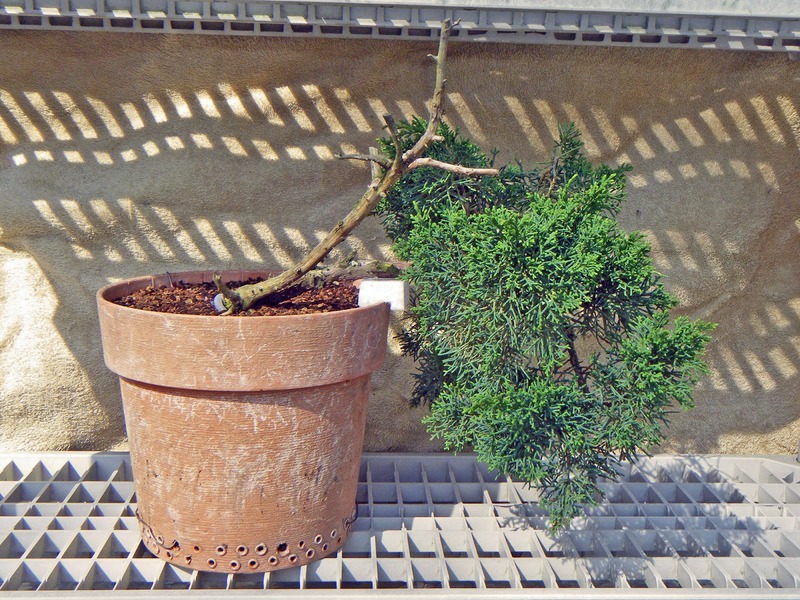 The tree will spend at least two years in this container, growing freely. I want it to put on some bulk before it is styled for the third time. One of the results of the damage the tree suffered in the past was that the first two stylings were ruined. Another setting. The dead trunk will be jinned later.